Unfortunately, your registration has been declined by the auctioneer. You can contact the auctioneer on 051 451 1439 for more information. You are the current highest bidder! To be sure to win, log in for the live auction broadcast on 13 May 2016 11:00 SAST or increase your max bid. Name: LombaMicrochip: 90008800301452D.O.B. : 2006Bloodline: ZambianMeasured: 9-11-2015Horn length: L 50+" R 49 4/8"Tip to tip: 7 6/8"Base: L 9 6/8" R 9 6/8"Rings: L 46 R 46Tips: L 8 6/8" R 7 6/8"Description: Lomba is a very impressive Zambian bull & serves 40 cows comfortably.Please refer to the terms & conditions of this lot. For Vleissentraal Bloemfontein (Pty) Ltd delivery information please telephone 051 451 1439. Should you wish to find out more about bidding online contact Micaela on 063 294 9844 for assistance. If you would like to view and watch the auction live on your mobile device please download PUFFIN BROWSER FOR ANDROID and PUFFIN BROWSER FOR IOS on this browser you will navigate to the auction as if you would on google chrome, once here you will view as guest or bid live now. Thank you! Any Successful bid will attract a 1% Surcharge on the Gross Hammer Price + VAT payable to the auctioneer. 1. The Sale by auction is subject to a reserve price, unless specifically stated to the contrary by the auctioneer. 2. The seller (owner) and/or his agent and the auctioneer may bid up to the reserve price of the owner (seller), but shall not be entitled to make a bid equal to or exceeding the reserve price. 45. (1) In this section, “auction” includes a sale in execution of or pursuant to a court order, to the extent that the order contemplates that the sale is to be conducted by an auction. (2) When goods are put up for sale by auction in lots, each lot is, unless there is evidence to the contrary, regarded to be the subject of a separate transaction. (3) A sale by auction is complete when the auctioneer announces its completion by the fall of the hammer, or in any other customary manner, and until that announcement is made, a bid may be retracted. (b) a right to bid by or on behalf of the owner or auctioneer, in which case the owner or auctioneer, or any other person on behalf of the owner or auctioneer,as the case may be, may bid at the auction. (c) the consumer may approach a court to declare the transaction fraudulent, if this subsection has been violated. (c) the sale of any property by auction. 4. The auctioneer will during the auction announce the reason for the auction unless the reason is the normal and voluntary disposal by the owner. 5. The auction will commence at the published time and will not be delayed to allow any specific person or more persons to take part in the auction. 6. All goods and livestock (hereinafter referred to as the “assets”) are sold by the Auctioneer as agent on behalf of the Seller, who hereby authorizes the Auctioneer to collect the purchase price from the Buyer and the seller do hereby cedes to the Auctioneer all the seller’s rights, title and interest in and to its claim for payment of the purchase price against the purchaser which session the Auctioneer do hereby accepts. 7. The purchase price excludes VAT and VAT must be added to the purchase price and paid by the Buyer, unless specifically stipulated otherwise by the auctioneer. 8. All assets shall, immediately after the bid has been knocked down and accepted by the Seller, be deemed to have been delivered to the Buyer. Notwithstanding delivery, the Buyer shall not be entitled to remove any purchased assets unless the total amount reflected on the Auctioneer’s invoice in respect of such assets has been paid in full. 9. Notwithstanding delivery, ownership of the purchased assets will not pass to the Buyer until the full purchase price plus interest, if any, is paid. 10. Subject to any reserve placed on any of the assets by the Seller, and the provisions of clause 11 and 12 below, the Buyer at any sale shall be the highest bidder indicated by the auctioneer by the fall of the hammer or by such other means as he or she may select. 11. The auction shall take place under the exclusive control of the auctioneer. The auctioneer re serves the right, in its sole discretion, to refuse the bid of any person, to regulate the bidding and to indicate the highest bidder. If the auctioneer suspects that a bidder has not made a bona fide bid, or is unable to pay the purchase price or has not made satisfactory arrangements for payment of the purchase price, he may refuse to accept the bid of such bidder or accept it provisionally until the bidder has satisfied him that he is in position to pay the purchase price or that he has made satisfactory arrangements for payment thereof. On refusal of a bid under such circumstances the assets may immediately be re-auctioned. 12. In the event of a dispute arising amongst the bidders and or the Auctioneer, the assets in dispute shall, at the sole discretion of the auctioneer, be re-auctioned. 13. Any error by the auctioneer shall be entitled to be corrected by him or her upon discovery. 14. All profit, loss or risk in the assets will pass to the Buyer once it has been delivered to the Buyer who shall at this own risk and expense remove it from the sale venue, subject to 8 above. The Buyer shall be responsible for all costs incurred by either the Seller or the Auctioneer until actual removal of the assets. 15. Should any contractor remove any assets from the sale venue on instruction of the Auctioneer, on behalf of the Buyer, the contractor will be deemed to be the contractor of the Buyer who accepts all costs and risks connected with such removal. 16. The Seller warrants that there are no encumbrances on such assets, that the said assets are the property of the Seller, and that the Seller is competent and legally entitled to dispose of the assets. The Seller further warrants as against the Buyer that the assets are free of any patent or latent defects. 17. The Seller, who offers the assets for sale, accepts all liability regarding the information furnished as to pedigrees, ages, date of service, state of health or gestation or any other particulars which might be incorrect. In the event of any dispute the Buyer shall only have a claim against the Seller and not against the Auctioneer. 18. The Seller warrants as against the Auctioneer that the assets are free of patent and latent defects and that any right or claim ceded to the Auctioneer in terms of these Rules Of Auction is free of any defect or right of deduction or set-off, and that the said right or claim is fully and immediately enforceable against the Buyer. 19. The Buyer shall, prior to the sale, ascertain whether there are any defects in the assets and any bid by a Buyer shall be considered as acceptance of the assets with any patent or latent defects in their condition at the time of sale. 20. The Buyer shall not be entitled to withhold payment of the purchase price to the Auctioneer as a result of any possible or pending claim that he may have against the Seller on the grounds of misrepresentation or for any other reason whatsoever. 21. The purchase price is payable by the Buyer to the Auctioneer in cash (to the discretion of the Auctioneer) or by bank-guaranteed cheque on the date of sale (“the payment date”) unless other payment terms and or means are agreed between the Auctioneer and the Buyer. The Company reserves the right to refuse any method or means as payment. 22.1 The election to make any payment to the Seller shall be in the sole and absolute discretion of the Auctioneer, which discretion may be exercised separately in regard to each transaction entered into by the Buyer. 22.2 Upon payment of the amount referred to in 10.1 above the Seller's right, title and interest in and to any claims and other rights as against the Buyer in terms of or connected with the sale of the assets shall forthwith be ceded and transferred to the Company which session the Auctioneer hereby accepts. 23.1 No Payment Terms Agreement shall be valid unless reduced to writing and duly signed on behalf of the Auctioneer. The facilitation of any sale by the Auctioneer as referred to in this paragraph 10 shall be strictly subject to the terms and conditions of the Payment Terms Agreement. 23.2 In the event of any conflict between the contents of this document and the Payment Terms Agreement, the provisions of the Payment Terms Agreement shall prevail. 23.3 No application for credit as defined in section 8 of the National Credit Act, Act 34 of 2005, will be received or considered by the Auctioneer. 24. Anyone that intends to bid at the auction (Buyer) must register his or her identity on the bidder’s record prior to the commencement of the auction and such registration must meet the requirements of the FICA (Financial Intelligence Centre Act, 2001) in respect of the establishment and verification of identity of the person and the person must sign the registration entry and the prospective Buyer must furnish the Auctioneer with a copy of his/her identity document and proof of residence. 25. Any person who purchases on behalf of a Principal (i.e. natural person) must furnish the Auctioneer with a written signed Power of Attorney, prior to the commencement of the auction, failing which he/she will be personally liable for payment of any purchases made by him/her. The person bidding on behalf of or signing any document on behalf of the purchaser pursuant to a successful bid hereby binds himself/herself personally as co-principal debtor with the Buyer for payment of the purchase price and personally guarantees all the obligations of the Buyer under this Rules Of Auction. 26. A person who attends the auction, to bid and to sign the bidder’s record, on behalf of another person (i.e. on behalf of a company or legal entity) must produce a signed letter of authority that expressly authorizes him or her to bid or sign the bidder’s record on behalf of that person. Where a person is bidding on behalf of another entity the letter of authority must appear on the letterhead of the entity and must be accompanied by a certified copy of the resolution, if required, authorizing him or her to bid on behalf of the entity. The person bidding on behalf of or signing any document on behalf of the Buyer pursuant to a successful bid thereby binds himself personally as co-principal debtor with the Buyer for payment of the purchase price and personally guarantees all the obligations of the Buyer under these Rules Of Auction. 27. In the event where a Buyer allows another person to purchase on his or her buyers number, the registered Buyer shall be liable for payment of such purchases. No bid by an unregistered Buyer will be accepted by the auctioneer and the Buyer will have no claim to any of the assets allegedly purchased by him. 28.1 irrevocably undertake to identify the purchased assets in such a manner that he can at any time identify and indicate the assets deemed to be the property of, and pledged to, the Auctioneer. 28.2 grants the Auctioneer at all reasonable time’s access to the premises where the assets are stored or kept for the purposes of perfecting its pledge and exercising any other rights in terms of these Rules Of Auction. 29. The Buyer and the Seller hereby consent to the jurisdiction of the Magistrate's Court in terms of Section 45 of the Act on Magistrate Court (Act 32 of 1944 as amended) for any action instituted by the Auctioneer against the Buyer although the Auctioneer is entitled to institute proceedings in any competent Court. 30. A certificate issued by a Manager of the Auctioneer, whose appointment and authority shall not be necessary to prove, shall be prima facie proof of the amount owing by the Buyer to the Seller or the Auctioneer. 31. Any indulgence granted by the Auctioneer to the Buyer or the Seller will not prejudice the rights of the Auctioneer in terms of these Rules Of Auction and such indulgence will not constitute an amendment or waiver or novation of these Rules Of Auction. 32. The entries made in the Company's auction roll shall be prima facie evidence of the transaction and shall be binding on the Seller and the Buyer. 33. The bidder’s record and the vendor or vendu roll will be made available for inspection within reasonable time after the auction at the office of the Auctioneer during normal business hours free of charge. 34. The Auctioneer does have a trust account into which all money will be paid for the benefit of the Seller. 35. Any assets entered or offered for sale are subject to payment by the Seller/Buyer of the agreed commission, or in absence of agreement the usual commission by the Seller/Buyer to the Auctioneer at the rate customarily charged by the Auctioneer from time to time, whether the assets are sold at the auction or thereafter, or at any time thereafter by private treaty. Unless otherwise agreed in writing, commission shall become due and payable by the Seller/Buyer upon the fall of the hammer or upon the entering into of any private treaty involving the Seller’s said assets, whichever date is the earlier, and notwithstanding any breach on the part of the Seller/ Buyer. 36. Every bid shall constitute an offer to purchase the property or goods for the amount bid, which the Seller or the auctioneer may accept or reject in their absolute discretion. The seller and auctioneer are entitled, in their absolute discretion to withdraw the property or goods from the sale prior to acceptance by the seller. 37. If no bid equals or exceeds the reserve price, if any, the property or goods may be withdrawn from the auction. 38. The Auctioneer accepts no liability for any withdrawal of assets from sale. 39. No bid may be withdrawn after the fall of the hammer until the expiry of the confirmation period (if any) that is provided for in the Conditions of Sale, during which time the offer shall be open for acceptance by the Seller or his agent and if the offer is accepted the sale shall be deemed to be a sale by auction for purposes of the Act. 40. The highest bidder in respect of immovable property, being the Purchaser, shall sign the Conditions of Sale immediately after the fall of the hammer. 41. The purchaser’s offer in respect of immovable property shall only be deemed to have been accepted when the seller or his agent or whichever may be applicable, has signed the Conditions of Sale on behalf of the Seller in the space provided at the end of the Conditions of Sale. 42. In the event of the sale requiring the consent of any statutory authority or any court of law, then this auction will be subject to the granting of such consent. 43. Any agreement contrary to these Rules Of Auction shall not be binding unless it is confirmed in writing and signed by a Manager of the Auctioneer. 44. The Company reserves the right to amend these Rules Of Auction in writing. 45. By entering a bid any prospective Buyer binds himself or herself to this Rules Of Auction. 1. 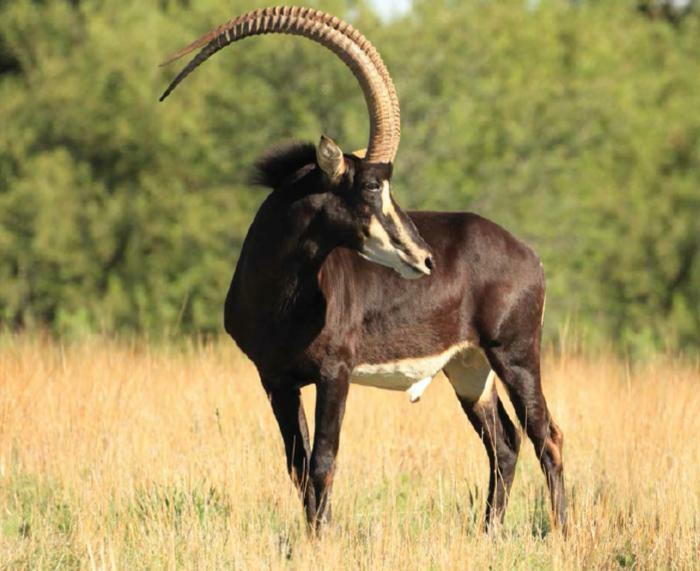 The purchaser of this lot shall obtain a 25 % share in the prize Zambian sable bull “Lomba”. 2. The purchaser will also be entitled to integrate 10 cows into the existing herd, which herd will then consist of 40 cows in total. 3. The herd will be kept on the Amanzi Private Game Reserve which will also see to the management and overall care-taking of such herd. 4. The Buyer and Amanzi Private Game Reserve will agree on an integration date, which date will only be in September 2016. 5. The Preliminary costs for the integration of such herd will be an amount of R2000.00 + VAT per animal per month. 6. This amount will include the following: management, monitoring, feeding, data capture, correspondence, inoculation and marking of these animals. 7. The amount however excludes all veterinarian costs, which costs will be the responsibility of the Buyer. 8. In order to limit the risk of possible injury to offspring, all calves will be moved to a separate camp after weaning not later than 10 months of age. 9. Records of all offspring will be accurately kept and all information logged on a regular basis. Such data will then be provided to the shareholders. 10. Each shareholder will become the sole owner of the offspring from their respective herds. 11. Amanzi Private Game Reserve herewith undertakes to at all times use their best efforts to ensure the well-being of the animals and to identify any and all problems which may occur from time to time and to then treat such animals to the best its ability. 12. Amanzi private Game Reserve will however not be held responsible for any fatalities which may occur due to any reason. 1. Vleissentraal’s standard conditions of sale apply. 2. Vleissentraal for its part guarantees nothing. Make sure you are satisfied with what you are bidding on. 3. Free delivery of game in South Africa. 4. 30 days free veld cover effective from safe step-off. For any claims the excess payment will be for the account of the buyer. 5. You are buying per piece to take the lot. 6. Terms are strictly cash or bank guaranteed cheques on the day of the sale. 8. A bid once made cannot be withdrawn. 9. The Principal has determined the sees as well as possible, but does not guarantee the absolute correctness of these. 10. All instructions have to be given in writing to the sale’s clerk at the sale. 11. The Auctioneers accepts no liability for the transport arrangements. 12. Before bidding make sure from Dept. of Environmental Affairs that your property qualifies for the game that you intend to buy. No permits will be issued if the requirements are not met. Buyers of listed TOPS species must beforehand be in possession of TOPS permit / Exemption permit / WR reg. certificate. All purchased animals have to be paid for today, even if a permit is refused by Environmental Affairs. 13. BEFORE opening the doors of the truck to unload the animals, count the animals aboard the truck in the presence of the truck driver. 14. Should an animal be severely injured before being loaded, we shall consult with the veterinarian, and on their recommendation, we shall have it destroyed. 15. Animals will be delivered as soon as possible, but only if the buyer has paid for them in full and has met all his financial obligations relevant to his purchases. Any arrangements made by the purchaser for the transport of game, are subject to the conditions set out paragraph 6. 16. Kindly complete a route sketch.